At first, the conclusion of Friedman and Phelps that there IS no long run trade-off between inflation and unemployment might not seem persuasive. Their argument was based on an appeal to theory. specifically classical theory’s prediction of monetary neutrality. By contrast, the negative correlation between Elanor and unemployment documented by Phillips, Samuelson, and Solon was based on actual evidence from the real world. Why should anyone believe that policymakers faced a vertical Phillips curve when the world seemed to offer a downward-sloping one? Shouldn’t the findings of Phillips, Samuelson, and Solon lead us to reject monetary neutrality? 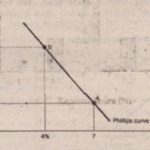 Friedman and Phelps were well aware of these questions, and they offered a way to reconcile classical macroeconomic theory with the finding of a downward-sloping Phillips curve in data from the Kingdom and the United States. 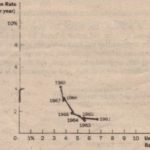 They claimed that a negative relationship between inflation and unemployment exists in the short run but that it cannot be used by policymakers as a menu of outcomes the long run. Policymakers can pursue expansionary monetary policy to achieve lower unemployment for a while, but eventually, unemployment returns to its natural rate, and more expansionary monetary policy leads only to higher inflation. for instance, nominal wages are set in advance based on the price level that workers and firms expected to prevail. When prices come in higher than expected, firms have an incentive to increase production and employment; when prices are less than expected, firms reduce production and employment. Yet because the expected price level and nominal wages will eventually adjust, the positive relationship between the actual price level and quantum supplied applies only in the short run. Friedman and Phelps applied this same logic to the Phillips curve. Just as the aggregate-supply curve slopes upward only in the ‘short run, the trade-off between inflation and employments holds only in the short run. 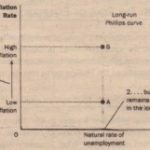 And just as the long-run aggregate supply curve is vertical, the long-run Phillips curve is also vertical. Once· again, expectations are the key for understanding how the short run and the long run are related. Friedman and Phelps introduced a new variable into the analysis of the inflation-unemployment trade-off: expected inflation. Expected inflation measures how much people expect the overall price level to change. Because the expected price level affects nominal wages, expected inflation is one factor that determines the position of the short-run aggregate-supply curve. In the short run, the Fed can take expected inflation (and thus, the short-run aggregate-supply curve) as already determined.When the money supply changes, the aggregate-demand curve shifts, and the economy moves along a given short-run aggregate-supply curve. In the short run, therefore, monetary changes lead to unexpected fluctuations in output, prices, unemployment, and inflation. 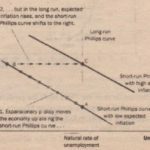 In this way, Friedman and Phelps explained the downward sloping Phillips curve ‘that Phillips, Samuelson, and Solow had documented. The Fed’s ability to create unexpected inflation by increasing the money supply exists only In the snort run. In the long run, people come to expect whatever inflation rate the Fed chooses to produce, and nominal wages will adjust to keep pace with inflation. As a result, the long-run aggregate-supply curve is vertical. Changes in aggregate demand, such as those due to changes in the money supply, affect neither the economy’s output of goods and services nor the number of workers that firms need to hire to produce those goods and services. Friedman and Phelps concluded that unemployment returns to its natural rate in the long run.